We strive to answer all of our customers’ most common questions about our point-of-use industrial coatings solutions. If your question isn’t answered here, don’t hesitate to contact us. Perhaps your question will land here to help future Saint Clair Systems customers. We use in-line heaters. How is SCS temperature control different? This is a common question. Most in-line heaters provide insufficient thermal transfer area to move sufficient energy into the subject fluid without excessive element temperatures, resulting in breakdown or premature curing of the fluid being dispensed. This often causes material defects (due to breakdown) or build-up on the internal surfaces of the heater. This build-up is progressive as each layer reduces the thermal transfer rate to the fluid and requires even higher element temperatures. A "vicious circle" results in fouling of the heater and contamination defects (dirt) as particles are dislodged from the wall of the heater and end up in the dispensed fluid, which often results in plugged tips. SCS carefully selects the appropriate heat exchanger for each application from a host of options (many of which are patented designs) to assure that the temperature differentials in the system are safe for the materials being controlled and that the temperature-control system will provide long-term, trouble-free service. Will the addition of temperature control increase my color change or cleaning time? A properly designed and implemented temperature-control system will add virtually no time and no solvent to existing cleaning processes. This is essential in optimizing line utilization while minimizing the process waste stream. I use solvent to control viscosity. How can temperature control help me? Because temperature impacts viscosity it is easy to show that properly applied temperature control can stabilize coating material viscosity and reduce the amount of solvent used in the process which obviously reduces the cost. In addition, solvent-related curing defects such as orange peel, poor adhesion, solvent pop, and gloss issues are all significantly reduced, which increases first-pass yield, reducing rework. There can also be significant reductions in energy usage and environmental impact when less solvent needs to be removed during the curing process. Is temperature control different from heating? heating, in most production fluid-dispensing processes, essential system components often add energy to the fluid resulting in excessive heating. Furthermore, variations in ambient temperature can change the way that a fluid-dispensing system performs. Though there are applications where heat-only or cool-only systems are appropriate, in most cases optimal results are obtained when a carefully designed heat/cool system is employed. How much volume does temperature control add to a system? A properly designed and implemented temperature-control system will add very little volume (often just ounces) to the fluid delivery system and in most cases, the majority of this additional fluid can be reclaimed at product changeover, thus minimizing waste. Why does temperature affect my coating process? All liquids change in viscosity as a function of temperature. This relationship is both inversely proportional and non-linear. As the temperature of a liquid increases, the viscosity decreases. Likewise, as the temperature of a liquid decreases, the viscosity increases. Coating materials are no exception. As a coating material changes viscosity, its behavior in a dispensing system will change accordingly. This is generally compensated for by adding solvent to the coating material (to reduce viscosity) or by changing system pressures. I use waterborne coatings. Do I need temperature control? Absolutely. Though most people think of water as being of constant viscosity, the fact is that its viscosity changes by a factor of 2:1 from 50°F to 100°F. This means that any coating made with a water base will change by at least 2:1 over the same temperature range. Since most water-based coating materials also include other solvents in the formulation, the viscosity change is even greater. I control the temperature of my coating booth. Why do I need temperature control? Though ambient temperature has a significant impact on coating-material temperature, other factors internal to the application system such as pump pressure, friction, shear, etc., often combine to add more energy to the coating material being dispensed than does ambient. Furthermore, the effect of ambient is determined by multiple factors including (but certainly not limited to) the surface area exposed to ambient and whether or not those surfaces are insulated. All of our studies have shown that ambient-temperature control alone will not control coating-material temperature within an acceptable range. Will temperature control have an impact on my energy usage? Will temperature control improve my environmental compliance? Again, in most cases, yes. Any reduction in solvent usage is good for the environment (not to mention the pocketbook). We've seen many cases where reductions in solvent use has resulted in the elimination of dozens-and in some cases hundreds-of tons of VOC's from the process annually! Results of this magnitude can eliminate the need to purchase permit credits or can reduce permitting requirements (and permitting costs). This is a win for the environment, a win for the corporate reputation, and a win for the bottom line! I am a spray painter. What defects can temperature control address? In a fixed-orifice process, such as spray painting, atomization and fan pattern are a function of the combination of flow rate, pressure, and fluid viscosity. A pump's output (pressure and flow) is also a function of fluid viscosity. Therefore, stabilizing fluid viscosity also stabilizes atomization and fan pattern. This results in control that can reduce or eliminate both run and sag, and dry spray. Furthermore, the resulting reduction of solvent in the coating reduces solvent related curing defects such as orange peel, adhesion, solvent pop, and gloss issues. I am a coil coater. What defects can temperature control address? Coil coating is a special case because variations in fluid viscosity across the width of the strip can cause variations in film build from edge to edge. These variations in film thickness cause different cure rates across the face of the strip which intensifies curing related defects. SCS developed our proprietary Profile Analysis and Correction (PAAC) process to specifically address this problem. When the variation in temperature (and therefore viscosity) across the width of the strip is eliminated, a smoother, more even coating is achieved resulting in a more even curing pattern. The ability to optimize coating system parameters around a stable viscosity allows for significant solvent reduction-in some cases elimination of solvent use altogether-which means reductions in curing defects such as orange peel, adhesion, solvent pop, and gloss issues. I am a composites manufacturer. How can temperature control help me? Temperature control can provide a host of benefits in various composites manufacturing processes. Gel coat, for instance, must be applied in a smooth, even deposition with no voids, runs, or sags in order to provide acceptable aesthetic and performance results. Stabilizing the viscosity of the resin aids in achieving this objective and can significantly reduce post-mold rework. Chop application can be optimized by stabilizing the resin viscosity at a point that minimizes resin usage while maximizing wet-out. In each of these processes, the temperature of the resin affects both curing profiles and styrene emissions-a particularly hot regulatory topic these days. Though heating is often employed alone in these processes, it cannot provide the often sub-ambient set-points that are required for this delicate balance. Accurate temperature control can provide optimal resin performance and reduced processing costs while helping to minimize styrene emissions. We dispense sealants and adhesives. What defects can temperature control address? Sealants and adhesives fall into the class of high-viscosity fluids. While they may share some functions with their coating brethren (e.g., corrosion prevention), they have a much different primary purpose-joining and sealing. Still, they exhibit the same properties with respect to temperature and viscosity as do all fluids. Proper location and thickness, often referred to as registration and bead profile, are the properties necessary for these fluids to perform their primary objective. If the fluid temperature is too high, the viscosity will be too low, which will result in the bead profile spreading out and thinning. On vertical surfaces, it may also "slump", losing its registration. If the temperature is too low, the viscosity will be too high, which can result in the bead profile being too high and narrow and thus not covering the area it is meant to join or protect. Each of these situations can be avoided by accurately controlling the fluid temperature. Can temperature control be used with 2-part epoxies? Yes, it can. Most 2-part epoxies result in an exothermic reaction when mixed, meaning that they generate heat. As this heat builds, the reaction rate increases, which in turn increases the rate of heat generation. This cycle continues until both reactive components in the mix are consumed. If the epoxy is being applied to a delicate substrate, this heating can result in damage to the part. If the processing rate is not maintained, the epoxy can cure prematurely resulting in product defect. Since the heating also initially reduces the viscosity (prior to set-up), sloughing and improper bead profiles can result. By adding temperature control, the cure rate and application viscosity can be carefully regulated thus eliminating these issues. How can temperature control aid my precision machining operation? Precision machining operations (drilling, boring, honing, grinding, etc.) by their very nature generate large amounts of heat. This is usually addressed through the use of a cutting fluid to provide both lubrication and cooling. The goal is to reduce the temperature of both the tool and the part being machined in order to reduce tool wear while increasing machining accuracy by controlling thermal expansion. Accurate temperature control of the cutting fluid, often implemented on a carefully designed cool-only platform, is essential in controlling costs and ensuring optimal first-pass yield. Experiencing a Paint or Coating Issue? Contact us for a free temperature control analysis. Our trained fluid and temperature control experts will assist in finding the source of your problem and get started in determining the best possible solution for your unique situation. 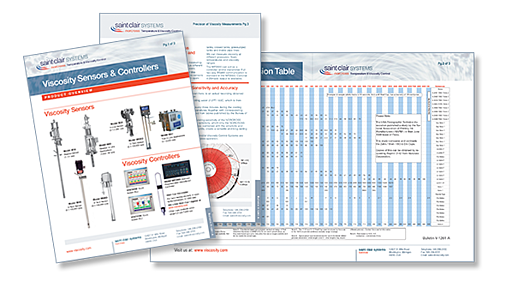 Perform accurate conversions between Shell and Zahn cup seconds, centipoises, SSU, SSF, and other viscosity measurement units.